The Japanese Pattern Challenge: Muslin #2, Mrs. Mole's fix and MORE! 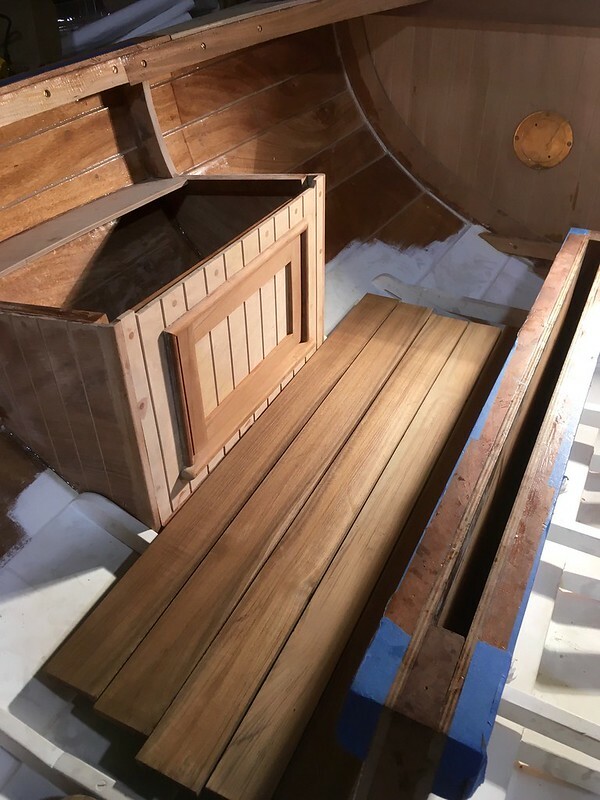 Great progress on the boat! The jacket will come along. Looking good. I know the feeling of the muslin fitting around the armscyes being frustrating. So glad it helped with the neckline gap! As we all age the upper spine bends forward and the neck and head just do the same so our clothes must follow to fit right. The drag lines from the back armhole were worse in the beginning, they are less now but if you had added a bit more in the slash, maybe 3/4 inch it would have allowed the upper jacket back to drop a little more and that seam wrinkle will not be there. If you let the sleeve drop 1/4 inch or so more unto the jacket body it might work but the issue and drag is still the upper back...slight but something worth mentioning. If this jacket were ever muslined in plaid or a check fabric you could see what it needs more easily. This is why women cross over to "the dark side" and become quilters and stop making clothes...the tweaking! Maybe that is why men build boats and tree houses too? Less work than making jackets? I admire your determination and precise skills!!! Thanks for sharing your frustration. But I am certain you'll have an excellent result in the end. You do fine work. The fit is so much better. Hang in there - you will make a perfectly fitting jacket soon enough. Mrs Mole rocks! Lots of people have issues with the back sleeve/armscye. But, you seem to be on the right path as it's gotten steadily better. I found Sarah Veblen's Photo Guide to Fitting to be an excellent source for solving my sleeve armscye issues. There is some really good information I've not seen anywhere else on balancing sleeve to armscye that worked really well for me. I made a coat this winter with the best fit in the armscye sleeve that I've ever gotten thanks to her book. It' not only hangs perfectly, its comfortable which has been a big issue for me. I have a right shoulder issue from an old injury and the right sleeve has to be set differently from the left. Perseverance is what the self taught tailor needs and you certainly have it. A thought on your wrinkly sleeve. There is no real reason (save another set of fitting issues) why you shouldn't take a gander at addressing this. It's a common feature of a lot of women's fitted sleeves. It's an edit worth considering; it's a nice arm and it shouldn't feel left out of the improvements. -- overflowingstash.com/2014/06/16/fitted-sleeve-sloper-part-1/ --covers a little of this. See that dart in the back seam? That forms a deeper spot for the elbow, and there's compensating shortness in the front. So the sleeve is permanently curved. In a two piece sleeve, you can make this a more elegant solution. Woodworking cannot be undone with a seam ripper, but I can use my sawdust in tailoring hams. Love em both. "Sometimes I feel that I fix one thing only to f$&@ up something else. Have you been there?" "It's easy to loose track of what I'm doing." Yes. In my day job, I test software, and write test cases in a spreadsheet to keep track of what I'm doing. With sewing, I generally don't do this, but I should. "I've changed my shirt with each adjustment so I can keep them straight." That is a great idea!!! I usually make some kind of (nice) hand gesture in the mirror to keep track of changes, like holding up three fingers for version 3. "Sadly, I don't have that patience. I'm burning out here. Fast." Fitting is an emotional vortex that I don't have the patience for either. I cried over my jeans muslin in 2012. I did 6 muslins then. Two weekends ago, I decided I would sew the red jeans for Pattern Review shopping day. I basically did 3 muslins and sewed the real deal in less than a week. Are they perfect? no. Do they have wrinkles? yes. Can I live with it? Turns out I can! And it was fun to be one of the 25 wearing red jeans. But if I wasn't sewing on a deadline, I might have kept going with the muslins. I am a perfectionist, but am seeing the benefits to "good enough" too. Eager to see your next stage--and your boat!! I'm so in love with this. I commend you for doing a jacket - I really want to try but so scared at the same time. The fit around the neck looks fantastic.